The scope of this document is to give you a general outline of the different pros and cons of the fall protection systems that we offer. 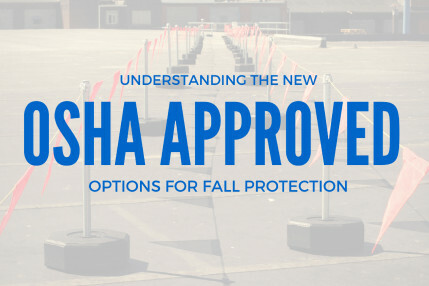 There are two principal forms of fall protection covered in this document: Passive and Active. Passive fall protection is most closely aligned with guardrail. Guardrail requires minimal inspection and virtually no training. 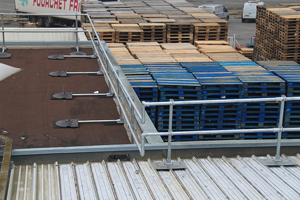 Simply put, passive fall protection requires no action from the rooftop worker once the system is installed. 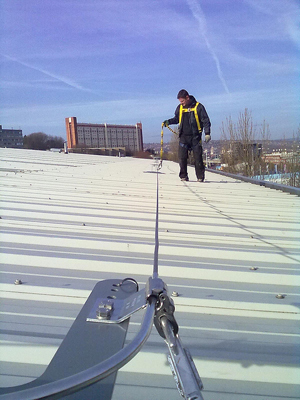 Active fall protection is typically aligned with horizontal lifelines and anchor points. It requires training, maintenance, inspection, and management on an on-going basis. Most importantly, it requires action from the user each time it is used. 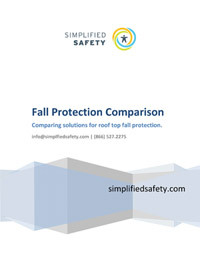 What is the difference between different types of fall protection? Pricing information is based upon estimated pricing of typical systems as of March 2019, our assumption is that price changes affect all systems equally. 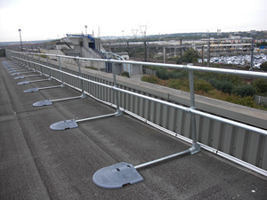 The best example of non-penetrating rooftop guardrail is the KeeGuard Rooftop Guardrail system. It is a counter-balanced system that is easy to install and can be adapted to just about any rooftop obstacle. 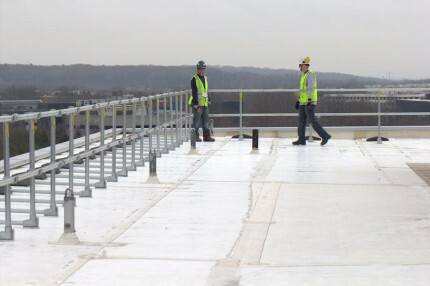 Easily assembled by a two-man crew, it can protect large sections of roof perimeter or provide smaller sections of spot protection. 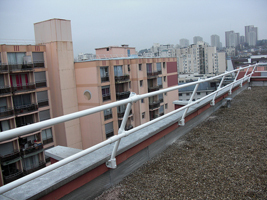 Parapet guardrails are permanent guardrails that are attached directly to the side or top of a roof parapet. Parapet guardrails are less expensive than non-penetrating guardrail but will require more labor costs and a suitable parapet to install. Lower linear foot cost than a counter-balanced solution. 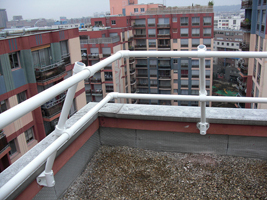 Easy to install, attaches directly to the parapet, avoiding penetration of the roof membrane. Railing has to be placed on parapet, making it more visible from below. 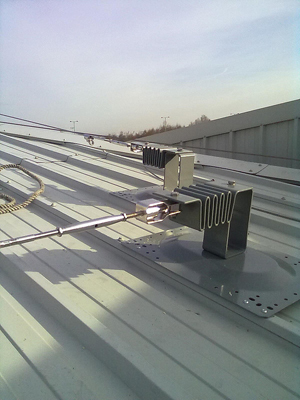 Horizontal lifeline systems are built along a particular path of the rooftop. 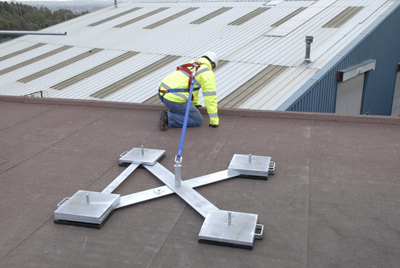 The rooftop worker ties off to the system using a harness and lanyard. Horizontal lifelines must be installed and maintained by specialized personnel. OSHA also requires all employees using the system to undergo competent person training for each system. Rescue plans and other safety management overheads are involved in all active fall protection systems. Requires the employee to wear fall protection equipment and properly tie off to the system. Requires attention from management to document the above and validate that the safety plan is being followed. Solutions such as the Kee Safety Weightanka and the Guardian Hammer fit into this category of portable, non-penetrating tie off points. These products allow workers to tie off in a particular location, but gives them the freedom to move the system when it is needed elsewhere. Higher risk of incorrect use. Adds additional work time to each job for setting up and tearing down the anchor point. Allows limited access before needing to be repositioned.